I drew this picture to illustrate the jumble I feel is going on. Just to recap, 6 months ago, had a manic episode and was hospitalized. I previously was not on any medications, but suddenly I was thrown back into all of that – psychiatric visits, side effects, adjusting dosages, trying different drugs. I’d definitely say the hardest part of the past 6 months was being depressed for a good chunk of that time. But almost equally hard, just in a different way, is the long term. Some of this journey has felt crazy. I was having hot flashes and cold sweats, my mouth tasted metallic, I threw up a few times (and I have a stomach of steel). At one point, I went on a drug called Cogentin. Its purpose was not to help with symptoms, but rather to help with side effects. 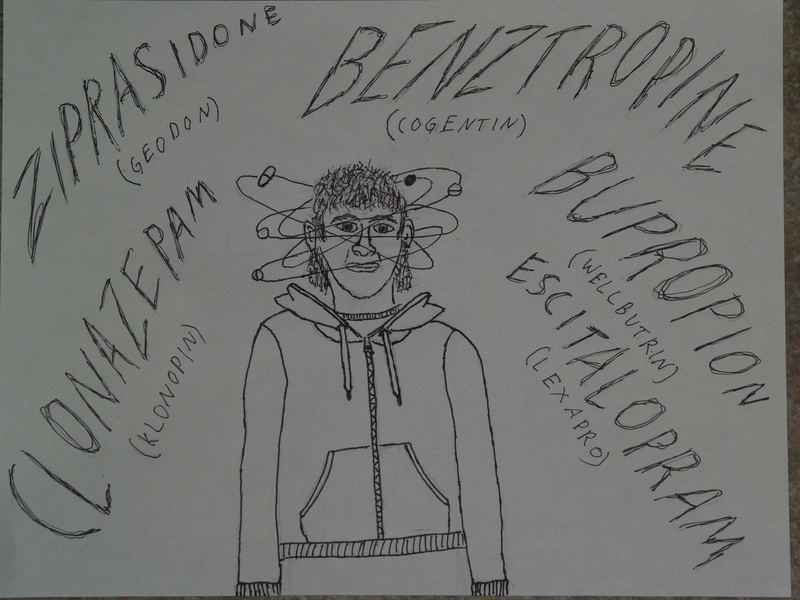 One of the other drugs, Geodon, typically causes hand tremors and a stiffening of facial muscles. When a nurse practitioner asked if I was experiencing these things, I said, “I guess so.” So she prescribed yet another thing to add to the mix. After 3 days of taking it, my nearsighted vision became blurry. Overnight. One day was fine, the next day, I couldn’t read the computer screen. I wasn’t reading books at the time, so that wasn’t an issue, but I remember eating food and not being able to see it and just feeling enormous sadness on top of depression. I didn’t put the pieces together, but luckily I had an appointment with my psychiatrist 2 days later, and when I mentioned the blurry vision, he said, “Oh, that’s common with Cogentin.” What? I also cycled through 4 different antidepressants within a short amount of time. Celexa, Zoloft, and Lexapro were making me feel famished all the time, which was just making me feel anxious. I got on Wellbutrin, and luckily that’s been side effect – free as far as I can tell. Ideally, I don’t want to be medicated. And it was so easy when it felt like that wasn’t on my radar. But now I am faced with all these decisions and timelines. And although there is strong input from other people (mostly my psychiatrist, who thinks I need to be on at least something for forever), it’s all ultimately up to me. For now, I just advocated for myself to lower the amount of Geodon (mood stabilizer / antipsychotic) that I’m taking. I feel really happy about that. I have plans to tackle Klonopin (anti-anxiety medication that I’m using as a sleep aid) next. As for Wellbutrin (antidepressant), I’m not quite decided. I’m just going to take these things one step at a time. Good luck… managing the health of your own mind can feel like a full-time job. Thanks – yes it does feel really weighty, but I feel like lessening the meds is the right track for me. I’ve struggled with the med free as identity thing too. For myself I think this is ultimately internalized abilism, as I’ve found a protocol that really works for me with minimal side-effects. Yet I still found it hard to accept myself as somebody dependent on medication long-term. I wanted to stop taking my anxiety meds when I started T, because….T should fix everything? One Rx is fine but 2 is too many? I stopped for a year or something til I started wondering why I was so anxious all the time. I hope you will find a med or no-med combo that works well for you! Ugh, I’ve totally been there, and I know what you mean with the med-free identity. As antidepressants go, in my experience, Wellbutrin was the best. It’s usually prescribed for a year, but it can be longer. Listen to your body and it should all work out. Yeah, I’d been on Wellbutrin years and years ago, and it seemed like the best med I’d ever been on. I could see maybe staying on it. Thanks! Yes, it certainly is confusing to be messing with something as important as your own brain and body! Good point! I have a lot of time to figure this stuff out… Thanks for sharing about your journey.